I’ve uploaded a Nevada Northern Railway video of the 2018 Winter Photo Shoot. Yes, it sounds a little odd – posting a video of a photo shoot, but things happen that way sometimes! I’d known about the Winter Photo Shoot for several years, and for one reason or another (it’s in the middle of nowhere, it’s a long drive, etc. ), I never went. Well, this year I went! Yes, it’s in the middle of nowhere – and it’s beautiful. Yes, it’s a long drive – and it’s a beautiful drive. So, why a Nevada Northern Railway video? Well, for starters, I’ve started to shoot more video lately. It’s easy these days. I’m not pretending or advertising myself to be a semi-professional videographer. I’m really just trying to preserve sights and sounds for myself and anyone interested. And, it’s kind of fun as I learn and fumble around with video editing. The second reason for the Nevada Northern Railway video is numbers. I shot over 1700 images at the Winter Photo Shoot, and I’ve got a lot of screening and sorting to do – and hopefully, if I did things right, not a lot of editing. I shot the videos, compiled them, converted them to black and white and added the title on my phone in a matter of minutes. It’s scary considering that I haven’t completely figured out the Videoshop app yet. Nevada Northern 40 and 93 ready to head east. East Ely, NV. I’m debating whether to post a color gallery or a black and white gallery or both. Yes, I know, you can order a black and white by clicking a button in the ordering process. If I purposely create a pure black and white gallery, I can emulate the film of the era and really give it the feeling of being there. 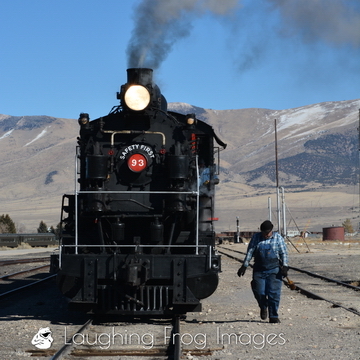 Being there (50+ years ago) is really what the Nevada Northern Railway Museum is all about. So, if you’ve got a few minutes (about 17 to be more specific), click here to be taken to the video gallery and step back in time to the sights and sounds of the past on a copper hauling railroad in the middle of Nevada. If steam locomotives are your thing, there’s more here on Laughing Frog Images. More to follow on the Nevada Northern. Don’t forget the upcoming March Madness sale!